Looking for Educational Tours at the Adelaide Central Market? Tours are specifically designed to cover the areas of the curriculum which your class requires. We will work with you to make your excursion one which the students will enjoy and they will be learning whilst they have fun! As one of our students commented "It was the best excursion ever!" We aim to achieve this for your group as well. Nihao! In between Asian food tastings and chopstick lessons our Chinese speaking guides open students eyes to Asian culture and language. Aimed at all year levels this tour links to the Asia/Australia cross-curricular priority. Using China as a representative of Asia this tour immerses students in Chinese culture through language, food and music. Our Chinese speaking guide will teach the students some basic language skills, how to use chopsticks, and introduce them to some contemporary Chinese music. The tour of the market whilst wearing replica Chinese school uniforms from 1000 years ago is an unforgettable experience and as they taste Asian foods such as seasonal fruits, Korean pancakes and steamed buns etc. 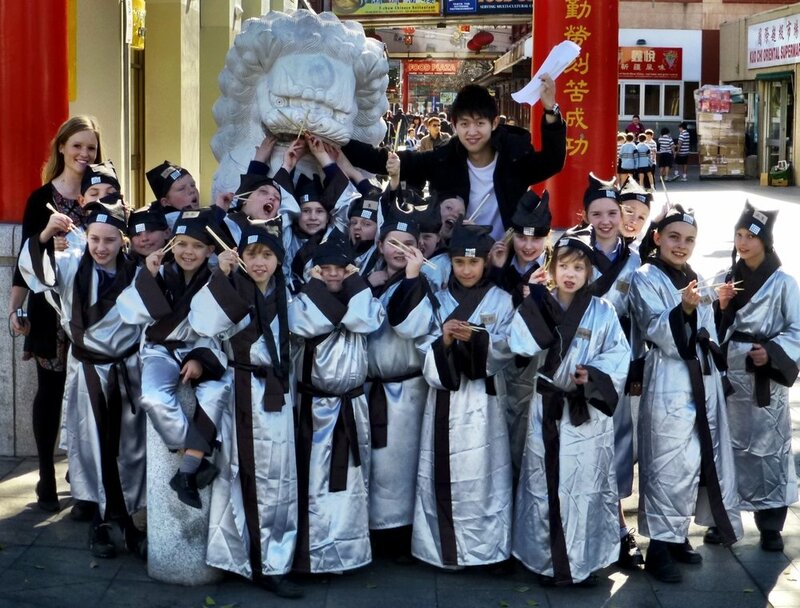 they will begin to develop a cultural understanding of the Chinese way of life and an appreciation of Asian foods available in Adelaide whilst learning of the history of the market and Asian migration to South Australia. Buongiorno! Our Italian speaking guides give students an opportunity to practice their Italian whilst learning about migration, the market and Italian cuisine. Aimed at Italian language students and year 5 geography students this tour encompasses interaction with an Italian speaking guide, for those studying Geography an opportunity to learn some basic Italian words, for Italian language students a chance to practice. The tour of the market whilst wearing beautiful replica Venetian masks is an unforgettable experience and as the students taste Italian delights such as olives, ciabatta, salamis etc. they will begin to develop a cultural understanding of the Italian way of life and an appreciation of Italian foods available in Adelaide whilst learning of the history of the market and Italian migration to South Australia. Selamat pagi! Our Bahasa Indonesian speaking guide will give students an insight into Indonesian food, language and the culture of our nearest neighbours. Aimed at Indonesian language students and year 4 HASS students- this is an opportunity to practice language skills and have an immersion into the Indonesian culture through food. The tour of the market whilst wearing beautiful original headgear from Indonesia is an unforgettable experience. The students will taste Indonesian foods, fruits and drinks and will begin to develop an understanding of Indonesian culture whilst learning of the history of the market and Indonesian migration to South Australia. Why not continue the Indonesian experience and stay for lunch in the Market Kitchen and enjoy a nasi goreng specially prepared for your group. Sawubona! African Guides lead students through some geography, cultural understanding, language, food and dance of the African continent. This tour is aimed primarily at Year 4 Geography students and gives students an opportunity to engage with our African Guides as they experience aspects of African culture through language, food, music and dance. Our African Guides share their stories and those of students back in Africa to enable your students to have an appreciation of life in Africa. The tour of the market whilst wearing African headwear is an unforgettable experience and as they taste African foods such as merguez sausages, ingera and beef jerky they will begin to develop a cultural understanding of the African way of life and an appreciation of African foods available in Adelaide whilst learning of the history of the market and African migration to South Australia. Learn about sustainable patterns of living, understand the importance of local food production and how to think globally and act locally. This tour is aimed at all year levels to cover the cross-curricular priority of sustainability. Guided by an expert, your students will learn about about waste management, have explanations of the importance of thinking globally /acting locally as well as carbon footprints and food miles. They will hear the story of the effects on the farmer producers of products such as quinoa and chia as these items increase in popularity in the Western world. Their tour will include a brief history of the market, a look at sustainability within the market place and some taste comparisons of mass produced versus artisan produced items such as bread, cheese and tomatoes. With 80 small businesses under one roof, meet the stall holders and get a personal perspective on business and enterprise in the Central Market. This tour is aimed at senior students of business, enterprise and economics. They have a unique opportunity to interact with stall holders and ask pre-prepared questions relating to supply and demand, what factors influence stall holder decisions, what factors affect success of a small business etc. It would be expected that follow up work back at school would be a report on a particular small business within the market. The tour of the market will include tastings at various stalls and will feature some of South Australia’s best produce. A highlights tour of the Central Market followed by a hands-on cooking experience looking at the “past, present, future” concept explored through food. This excursion starts with a 30-minute highlights tour of the market focusing on the variety of foods available; the various cultures represented – why they came here and when; nutrition and sustainability. After the tour, in the Market Kitchen the group divides into cooking teams, each preparing a different dish using the same basic ingredients. The first team prepares the food as it would have been prepared in the past, the second team prepares their dish to show today’s trends in food preparation and the third team prepares the dish as it may be prepared in the future. The students all have an opportunity to taste the food from the different eras, and as a group discuss the differences with regards to health, nutrition and sustainability. This tour encompasses some of the HASS, Health and Physical Education, Design and Technology and sustainability aspects of the curriculum across all year levels. Cheese isn’t just cheddar – taste 8 different types of cheese and learn about the manufacturing, handling and serving processes. In this tour students will learn preparation, presentation and storage of cheese from a cheese expert. They will have the opportunity to try blue, cheddar, eye, fresh unripened, hard, stretched curd, washed rind and white mold cheeses as well a taste comparison of a variety of cheddar varieties. We have developed a visual demonstration to show the importance of hand washing additionally we also give the students an opportunity to look at sustainability by looking at a working kitchen waste management system and also offering a taste comparison of mass produced and artisan produced items. A market tour to look at the cheese stalls concludes a tasty session. This tour meets the requirements of SITHCCC306. An opportunity to view and describe the Central Market in a visual way using a variety of media led by a highly qualified art teacher. Our highly experienced art specialist teacher will lead the group in an activity designed to their year level and linked into their market experience, so they may delve into Asian art styles to link into a Chinese tour; explore the intricacies of fruit; design their own market stalls – the possibilities are limitless. The visual arts tour has the capacity to engage, inspire and enrich the lives of students, encouraging them to reach their creative and intellectual potential by igniting informed, imaginative and innovative thinking. This can be a stand alone tour or combined with another tour – please enquire for options. This excursion includes a highlights tour of the Market where we can compare prices and shop for ingredients for a meal within a pre-determined budget. Students will need to analyze costs and calculate the most cost effective way to purchase their required items. After the hunting and gathering tour we will return to the Market Kitchen where students can prepare the food they have collected and share the meal. After the shared meal the students can calculate price per head and compare the health, nutrition and sustainability aspects of their food choices. The menu chosen can be aligned to areas of the curriculum specific to the learning requirements and cooking abilities of the class. Additionally we can offer recess and/or lunch provided in the Kitchen or a packed lunch to take out and share on Victoria Square. Lunches and recess can be themed to your tour experience.